1. VOTE NO on $49.5 million Home Rule budget, including $149,000 budget for a ” sustainability ” czar. 2. 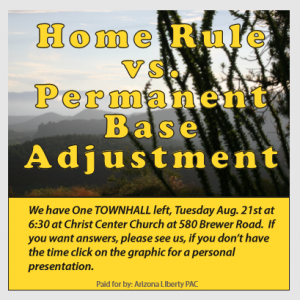 VOTE YES on $36 million Permanent Base Adjustment (PBA), with NO CUTS for city services nor support to non-profits. 3. STOP “giving” $2.5 million to the Sedona Chamber of Commerce, a private business financed with taxpayers’ money. 4. FORGET the $30 million for Sedona in Motion (SIM), have the traffic experts and not the city manager tell us what to include. 5. WAIT for recommendations by civil engineering firms and the public works engineers to decide how to reduce traffic congestion. How about the VOC? We don’t want to pay for Sedona’s traffic problems. Right now we a a so called “grassroots” group in the Village working with the county supervisor Garrisons blessing to look at alternate routes here for Sedona’s and now our traffic problem. One thing the county loves to do in the Village and other unincorporated areas is form special improvement districts and pass the cost on to the residents. Once these districts are formed they become lawless entities answering to NO ONE and tending to their own needs while completely ignoring the residents and turning these districts into cash boondoggles for a select few. This grassroots group has an email,no website, no information available but will be sending out 6,000 surveys in the Village. Who are they? No one knows! Past surveys here are NEVER what they seem. The questions are always geared to an answer about 20 people here want. You think you have corruption? This place is a joke and even the 20 dark players are losing their power to the corporations moving in. I’m a Democrat who walked away. Stop drinking the party kool ade. My peers aren’t voting D this next election. The Red Rock Fake news did a hit piece editorial on me today. It was hilarious. I can’t wait for Friday’s edition. Although, it will be hard to top todays as an endorsement. It will be right up there with those news outlets predicting Hillary wins with 90% of the vote. Red Rock Fake News strikes again !! Do you want your town back? Vote NO on Home Rule, No to all incumbents. Don’t throw stones when you live in glass houses. Never should we be backing Sinema or LeFevre Anti American types that put on fake mantles to play us as fools which we are. You want to vote independently and not party or you’re ignorant asses. Bad mouth current President then remember what we had before all the way to Johnson and Nixon wasn’t much better. VOTE for the PERSON’s POLITICS not their PARTY affiliation.